If you’ve ever seen someone casually steering a standup paddle board (SUP) down a local river or across a tranquil bay, your first instinct might be to think: that looks easy. I suppose relative to its close cousin, surfing, it is. However, no matter how you slice it, standing up on a platform on the water isn’t always a breeze, as anyone who has ever fallen off a floating dock can attest. And a standup paddleboard is significantly smaller than a dock. Still, on land at least, it looks pretty big -- your average SUP board is 9 to 12 feet long and up to 3 feet wide, making it about the same dimensions as a traditional longboard for surfing (although modern longboards typically top out at around 10 feet). Like surfing, standup paddleboarding has its roots in Hawaii. 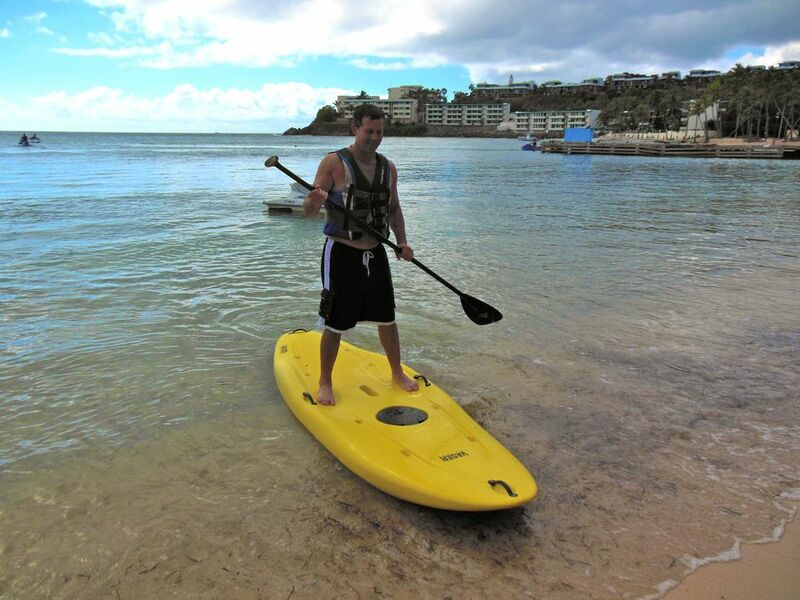 The other major piece of equipment you’ll need is the paddle, of course, adjusted to your standing height to allow you to propel and turn the board once you are on the water. Finally, you’ll want to wear a personal floatation device (PFD), a.k.a. a life jacket. Seems simple enough, I say to myself. And in truth I’m doing pretty well as I make my way out into the calm bay, paddling slowly but steadily. This is not a sport built for speed -- zen-like relaxation is more the goal. You’re standing up, of course, so you have a great view of wherever you are going. Which brings up another good pointer -- keep your head up and your eyes where you are heading, tempting though it is to look down at your feet. “Keep your knees bent, your eyes forward, and paddle like you mean it,” says Kendall Cornejo, who runs the watersports shack at Cinnamon Bay on nearby St. John, where you can rent a standup paddleboard for $30 an hour or join a two-hour sunset excursion for $40 (at Bolongo Bay, lessons and rentals are included in the price of your all-inclusive package). You can’t get too relaxed, however. Because as soon as a few ripples come along -- even ones that don’t even deserve to be called “waves” -- you’ll realize that in order to stay upright you need to constantly make small but critical balance adjustments in your legs and especially your core. The bumpier the ride, the more you find yourself firing off little muscles all over your lower body -- hey, this is a pretty good workout! Inevitably, I paddle a little too far out where the waves start to resemble, well, actual waves. Into the surf I tumble, fortunately avoiding the board itself and bobbing back to the surface not too far from my paddle. Remounting the board is pretty easy, but I don’t need the added encouragement from Dave and Yoshi to steer my way back into the calmer waters. Paddleboarding: You WILL Stand Up the First Day! Once you get the hang of it, standup paddleboarding is a lot of fun. You can leisurely skim the surface of the water and take in the beautiful Caribbean landscape around you, peer down into the water to spy fish and turtles, and even take a hand off the paddle briefly to wave at passing boaters. The learning curve isn’t too steep -- a 15 minute lesson and 15 minutes on the water should get you feeling at least a little confident up there. Unlike the experience many have with surfing, you're almost certain to be standing on the board the first day, although this is a sport where you can advance to attacking real waves like a surfer, which obviously takes a lot more practice. For beginners, it does help to have some decent balance and a bit of core strength ... another reason besides getting a good beach body to do a few sit-ups before heading down to the islands!